I have listed the breakfast cereals in descending alkalinity (PRAL) order, but you can click any column heading to reorder the table. See the links within the table for explanations of the nutrition data. 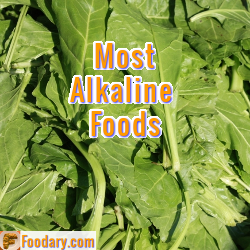 That explanations page also has links to other alkaline foods lists that you can use to analyze your total diet. Where your total diet is weak, use the tables to find healthier options. I will improve the alkaline breakfast table in future to allow you to input your own nutritional requirements. Which fruit do you add to make your breakfast cereal an alkaline meal? As you can see, few breakfast cereals from the key foods list have an alkalizing effect on the body. Those that do are overloaded with sugar and salt. Your healthiest choice is to select wholegrain breakfast cereals that are naturally high in fiber, but without added sugar and salt. Add fresh ripe fruit for sweetness if you wish. If you have any questions about this Alkaline Breakfast List, please join the alkaline breakfast list discussion.